Lighthouse Studios, the joint venture formed in February 2017 by Canada’s Mercury Filmworks and Ireland’s Cartoon Saloon, has appointed Claire Finn as its new managing director. As MD Finn, who most recently served as head of content/executive producer for London-based Firecracker Films, will be responsible for growing the studio’s development commitments and expanding production projects, focusing on high-end children’s and family animated content. Finn takes the helm at Lighthouse Studios just as the studio was wrapping Bug Diaries, the animated comedy series for pre-schoolers based on the witty children’s books by best-selling author Doreen Cronin and best-selling illustrator Harry Bliss for Amazon. Mercury Filmworks CEO Clint Eland said: “Claire brings a wealth of experience in content development, production, design and the management of artists, all of which will benefit Lighthouse Studios in growing its pipeline. Guru Studios has appointed Hengxin Shambala Kids Cultural Industry Development (HSK) to represent its flagship property True and the Rainbow Kingdom in China. HSK will look to secure opportunities for the brand in China across television, toys, publishing, non-toy merchandise, digital games and apps. True and the Rainbow Kingdom continues to grow in popularity worldwide on Netflix as well as on Canada’s national public broadcaster the CBC where it has emerged as one of the top preschool shows. 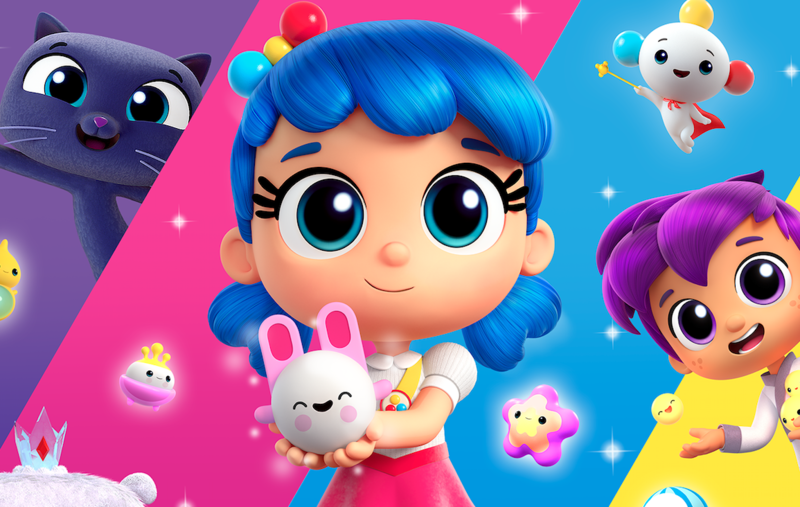 True and the Rainbow Kingdom is a Netflix Original preschool series produced by Guru Studio in collaboration with Pharrell Williams’ i am OTHER, world-renowned artist collective, FriendsWithYou, and Home Plate Entertainment. “There’s no question China has emerged as one of the most significant new markets for building a global children’s brand,” said Frank Falcone, president and executive creative director of Guru Studio. Viacom International Studios has greenlit a second season of Noobees for Nickelodeon Latin America with co-production partner Mediapro group. The first season of the show, which premiered in September 2018, yielded more than 10.4 million pay-tv viewers in the region positioning itself in the No. 1 spot with girls ages 4-11 in Mexico, and performing +64% above the channel average with kids 4-11, according to Viacom. Noobees season two is written by Argentine screenwriter Marcela Citterio, whose hits include Nickelodeon’s tween/teen favs Yo Soy Franky and Chica Vampiro. “Noobees connected incredibly well with viewers in the region and created an amazing fan base for the show and its characters,” said Tatiana Rodriguez, senior VP of programming and creative strategy for Nick LatAm. Javier Méndez, content director of Mediapro, added, “We are really proud to announce the second season of this series with Viacom, and we are sure Noobees will keep succeeding with its amazing stories in the e-sports universe”.